Meadows at Lake Ridge, an active adult community in Whiting. The Meadows at Lake Ridge is a 55+ Active Adult Over 55 Community in fact, is located in the Whiting section of Manchester, Ocean County. In 1999 construction on 230 homes began, and by 2003 construction was completed. However, resales are often available. While grocery shopping is nearby, major shopping areas are in Toms River and Brick. 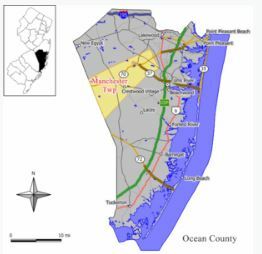 In addition, The Jersey Shore are a short ride away. Additionally, in just a few minutes you can be on the Garden State Parkway heading south to Atlantic City. Because of the reasonable taxes and association fees this area a popular destination for seniors. The association is responsible for lawn maintenance, snow removal and trash removal. Therefore, a monthly fee is charged. And, as with many associations, there is a one time capital contribution fee due from the buyer at closing. In addition, your pets are welcome here. There are 230 homes in The Meadows at Lake Ridge, and 6 different models. These homes were built between 1999 and 2001 and have 2 bedrooms, 2 baths and either a 1 or 2 car garage. Home prices are typically under $300,000, the homes range in generally from under 1400 square foot to almost 2000 square foot. The homes were originally heated with oil, but many homes have been converted to gas heat. The Meadows at Lake Ridge has a Clubhouse with an outdoor pool, Game Room,. Also, there are tennis courts, shuffleboard and a fitness center. Additionally, you’ll find clubs, trips, social gatherings and more. Nearby you’ll be able to enjoy local activities such as fishing, boating, golf, shopping, dining and much much more. When you’re ready to either buy or sell a home in The Meadows at Lake Ridge, contact us. Call Bunny and Art Reiman – the Active Adult Community Specialists. Call 732-616-6226 for an appointment to see the active adult community homes in The Meadows at Lake Ridge.